BlackBerry has a big plan with the BBM app for Android and iPhone, which means both of these new platforms are crucial for the brand to achieve their goals. It seems that BlackBerry want to position BBM with a cross-platform download on Android, iPhone’s iOS and other platforms to aid both a potential sale and separation into another company. BBM Inc. an obvious direction – this move shouldn’t surprise our readers considering the rumors and news from the last few weeks. We have previously reported how the BBM app might create revenue on Android and iPhone, which could include a token fee or add-on services. The BBM rivals have been enjoying Android and iPhone prosperity for a while now and some people wonder why it has taken BlackBerry so long to release this application? The need for the app was shown once again after a recent report highlighted the decline in BlackBerry phone sales, so separating the BBM app into a subsidiary and launching on two of the biggest mobile platforms is certainly the new direction needed that we talked about in an earlier article. WSJ is the source of this latest rumor and they explain part of this move would be to give the new company a lot of independence with their chat app. This would hopefully bring more creativity and deliver focused features for BBM on Android, iPhone’s iOS and BlackBerry phones themselves. We have already seen a few differences between iOS and Android in the BBM beta manual download that leaked a few days ago. It is thought that the BBM app has 60m users without iPhone or Android, so you can imagine the growth possible once the app hits a release date next month. We say next month, as this is the end of summer, although no BBM launch date has been given at the time of writing. Teens in particular have been buzzing about BBM coming to their Android or iPhone device, and this is welcomed by millions of users that used to be on BlackBerry and miss features like BBM pins. 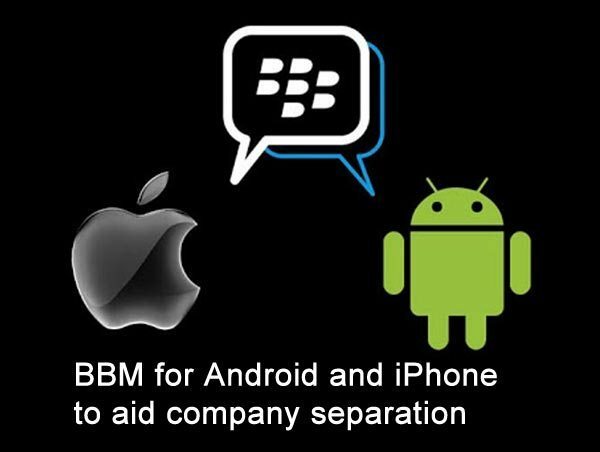 Do you think creating BBM Inc. would help the app compete on Android and iPhone better? Competitors include ChatOn, WhatsApp, Skype and many more although we know there are thousands already lining up for BBM on Android or iOS, and these people have told Phones Review that BlackBerry Messenger is “light-years ahead of other apps” with better navigation and features. It is worth pointing out that insiders claim a desktop version and cross-platform BBM service has been ready to launch for years, but executives wouldn’t give the go ahead and we feel this might have been one of BlackBerry’s worst decisions considering the power of apps in 2013. BBM should consider the Windows platform as well ! !